HELP OUR STUDENTS TRAVEL TO WASHINGTON D.C.
GOOD STANDING W/ TEACHER EVAL. New Understudy Enrollment is held Monday-Friday from (10 a.m. - 11 a.m.) & (1 p.m. - 2 p.m.) By APPOINTMENT ONLY. John Lewis is one of our nation’s prominent civil rights leaders. He was born the son of sharecroppers on February 21, 1940, in Troy Alabama. John Lewis attended segregated schools and was inspired by the activism of Martin Luther King Jr. As an adult he adopted the nonviolent philosophy and was active in the Civil Rights Movement. 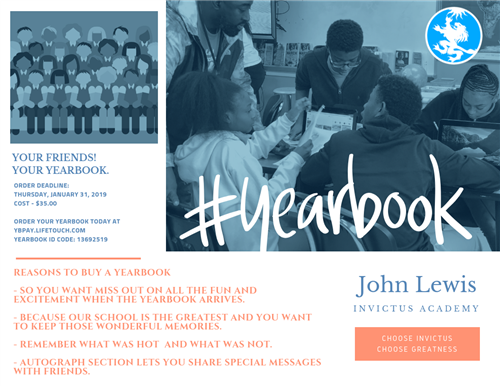 In honor of the philosophies adopted by John Lewis, Atlanta Public Schools opened John Lewis Invictus Academy in the Fall of 2017. The culture and expectations of this new school are symbolized by a civil rights icon and a poem that represents persistence, self-mastery, and an unconquerable spirit. 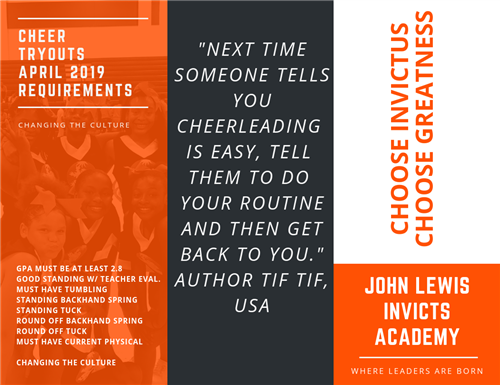 John Lewis Invictus Academy is a comprehensive three-year public middle school enrolling grades 6–7 and will be adding 8th grade next year. The school opened with 6th grade only and will add a grade level each year. The school will be graduating its first eighth grade class in the spring of 2020. 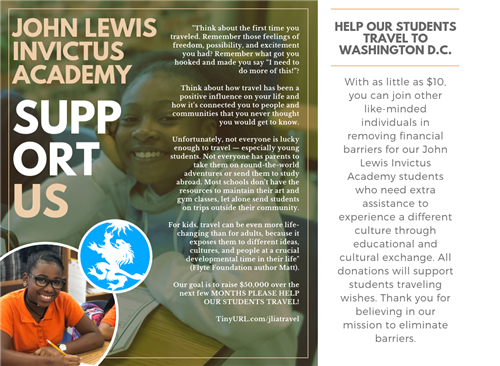 John Lewis Invictus Academy is the middle school for Douglass Cluster elementary schools. In 2018 John Lewis Invictus Academy adopted the Summit Learning program in order to help shape the mindset of our students. “Those who think they can and those who think they can’t are both right” - Confucius. We want to ensure that our students are aware that self-confidence is a part of the learning process. If a student believes that they are able to achieve greatness that will help them demonstrate the behavior of those who are successful. They will work hard to reach any goal that they aspire to reach.